Varicose veins are twisted and distended veins. Although any vein may actually turn varicose, most often, it’s the legs and feet which are usually affected by this condition. This is due to the fact that these bodily parts are subjected to greater pressure during standing and walking. How an individual suffering from varicose veins views this condition will differ. For some, it is simply a cosmetic issue. While for others, it becomes painful and uncomfortable. In some cases, it may even lead to more complicated medical problems. In fact, the presence of varicose veins maybe an indication of circulatory issues. · Age. The risk of having varicose veins becomes worse as an individual age. Aging causes the valves in the veins to deteriorate. These valves help normalize blood flow. This deterioration will lead to the blood being trapped in the veins instead of being ushered back to the heart. · Gender. Women experience having varicose veins more than men do. This can be attributed to hormonal changes which occur during pregnancy, menstruation or menopausal period. These hormones slow down vein walls. Hormone replacement therapy and birth control pills will even add to the risk of having varicose veins. Varicose veins developed during pregnancy normally disappear naturally within 3 to 12 months after delivery. · Obesity. Weight adds more pressure to the veins. · Standing or sitting for an extended period. Blood doesn’t flow when one is on a stationary position for a lengthy time. Aside from the aesthetic reasons behind seeking help for varicose veins, medical reasons should also be considered. 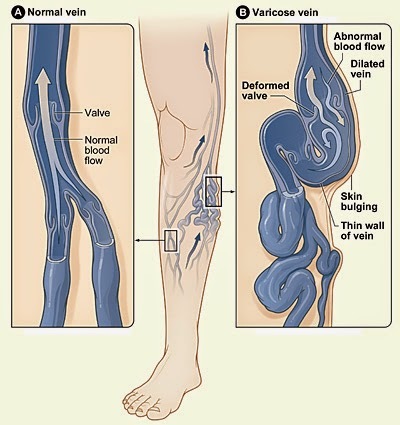 As mentioned above, the presence of varicose veins may actually imply more serious medical issues in the vascular or circulatory area. You need to seek medical attention immediately when varicose veins are accompanied by skin ulcers and when pain is no longer bearable. Before we discuss about possible treatments for varicose veins, how to avoid it must be talked about first. As they say, prevention is better than cure. But there is actually no concrete method which can be used to completely prevent varicose veins or avoid having it. But through muscle tone and circulation improvements, you can at least lessen the risk of having varicose veins or the tendency to develop more. Preventing or avoiding varicose veins can be done through the same methods applied at home to minimize associated discomfort. Engage in exercises which encourage leg movement. One of such exercises includes walking. This promotes proper blood circulation in the legs. A physical therapist or even a gym enthusiast alone can be able to recommend more physical activities to get your legs moving regularly. Weight adds more pressure to the legs. Thus, gaining weight won’t help but losing weight does. Being mindful of your diet is also helpful. Eat foods that are high in fiber and/or low in salt content. Salty foods cause water retention and leg swelling. Don’t always wear high heeled shoes if you can’t completely avoid it. Shoes with low heels place pressure on calf muscles and not on legs. High heeled shoes do the opposite. Also, lessen the use of tight clothing strapped around your waist, groin, and legs such as tight-fitting pantyhose or leggings. These types of clothing may obstruct proper blood flow. Elevating your legs above the level of your heart can help improve blood circulation in the leg area. So spend a few minutes of your time daily for this purpose. What you can do is to lie down flat but with your legs elevated through a few pillows. Avoid standing or sitting for too long and change your position from time to time to promote blood flow. It’s recommended to stand up when sitting down or sit down when standing up every 30 minutes. Some health professionals believe that sitting with legs crossed can actually contribute to problems with blood circulation. Treatment for varicose veins doesn’t require hospitalization or a lengthy recovery period. There are non-invasive procedures which can be able to treat varicose veins as an outpatient. Earlier, home treatments for varicose veins were mentioned. These allow patients to apply self care through practical methods which do not require you to spend money. Self care and home treatments can lessen the pain associated with varicose veins and prevent it from getting worse. Compression stockings are the first method often recommended for varicose veins. These are worn daily. What they do is to squeeze your legs consistently to encourage effective blood flow. Compression applied varies depending on the type of stockings and the brand. Prescription varieties are also offered. Variations are also present in terms of strength, styles, and colors. Differing features make the prices different too. But with numerous options available, anyone can find compression stockings they will be most comfortable with. Compression stockings can be purchased in pharmacies and medical stores. Aside from considering the features mentioned above, you need to make sure that the stockings actually fit. Measure your legs with a tape measure and compare it with the product’s size chart to get the perfect size for you. These items must be strong but not necessarily tight. In case you have issues wearing them due to arthritis or other problems, there are devices which will make it easier for you to wear compression stockings. In sclerotherapy, your doctor injects a solution which will close the varicose veins. With sclerotherapy, varicose veins can fade in a few weeks. Although it may require more than one injection, the method is at least effective when properly applied. It doesn't need anesthesia and can be accomplished right in the doctor's office. Catheter aided procedures are normally applied for large varicose veins. In this procedure, a thin tube or caterer is inserted into the vein and is heated. Heat seals and shuts the vein. Long varicose veins are removed through small incisions. Vein removal won’t affect blood circulation because veins found deep in the legs will continue the process. Vein removal is applied as an outpatient procedure. Ambulatory phlebectomy is another outpatient procedure and is applicable for smaller varicose veins. Here, the doctor removes veins through small punctures. Expect minimal scars. In endoscopic vein surgery, your physician will close varicose veins and remove them through minor incisions. He will be aided by a thin video camera for visual assistance. This is also performed as an outpatient procedure. Laser surgeries are performed for small varicose veins. Here, no incisions will be required. Laser surgery applies powerful laser light onto the veins which will make them eventually fade and vanish. As a conclusion, it pays to be cautious when it comes to products being offered in the market for varicose veins. Make intelligent researches before buying items including potential dangers and side effects. It’s best to consult your doctor. Also, before undergoing any procedure, confer with your insurance policy as most cosmetic treatments are not covered not unless inflammation or bleeding is involved. Lastly, although most current procedures and treatments are effective, there is still a tendency that the varicose veins may reoccur.